“Wait a minute, did you say: ‘pumpkin’?” Yes, we have heard that question many times after someone has tried a slice of this cake and we finally reveal the main ingredient: Pumpkin. People expect a funny taste if you mention it at the beginning and seem a bit reluctant to try; whereas if you mention it after they have enjoyed a slice or two, then they are amazed! As we like to say, we love how veggies can come in handy; and this time, for something sweet! The original recipe calls for a can of pumpkin puree. But why buy a can when you could use fresh pumpkin puree? It is not so difficult to make, at all. Just pop it in the microwave (cut open, wrapped with cling film), cook for 10 minutes, discard the seeds, scrape the pulp and blend in a food processor and you are set! The combination of spices gives it a zing and is not overpowering. The nuts add a little crunchiness to it. This cake makes a great accompaniment for coffee time or afternoon tea. Prepare 2 cups of pumpkin puree as indicated above. Transfer to a mixing bowl. Beat in the eggs one at a time. Mix in the sugar and melted butter. In a separate bowl sift the flour, spices, baking soda, baking powder and salt. Turn the mixer to slow speed and slowly incorporate into the mixture in three batches. Mix thoroughly. Turn off the mixer, take aside, fold in the nuts (if desired). Preheat the oven at 300°C. Grease two 9x5x3-inch (23x13x8 cm) loaf pans. Divide batter equally. Bake for 1 hour, until tester comes out clean. Transfer to cooling racks. Source: Adapted from Bon Appétit on Epicurious. 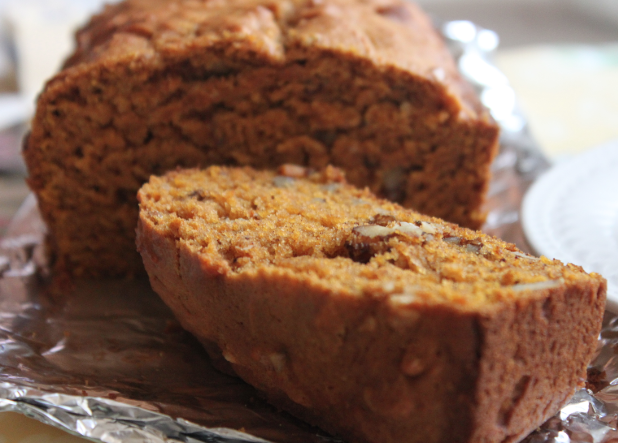 Categories: Pumpkin, Recipes | Tags: cake, dessert, ground cinnamon, ground cloves, ground nutmeg, spices | Permalink. Looks delicious! I haven’t tried using fresh pumpkin before. I like that idea!